The one-time assistant of Sir Alex Ferguson is back at Dens Park to help manager John Brown. 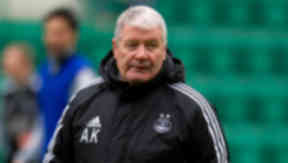 Archie Knox has returned to Dundee, taking up a player scouting role with the Scottish Championship club. The manager of the Dens Park side between 1983 and 1986 returns to assist boss John Brown with identifying new talent across the UK for the squad. Knox has been out of a job since departing Aberdeen earlier this year, where he worked as assistant to Craig Brown. The 66-year-old was Sir Alex Ferguson's assistant as the Dons won the Cup Winners' Cup and European Super Cup in the 80s and, having left Dundee to link up again with the former Manchester United boss, followed him south as he took up the reins at Old Trafford. Knox has also served as assistant boss at Rangers, Everton, Millwall, Coventry City, Bolton Wanderers, Livingston and Motherwell, as well as with the Scottish national side.